Dry shampoo – or hair powder – is the best thing to absorb oil between washings, but we invite you to think bigger: Use it to plump up fine hair, boost bangs, lift roots, keep the ‘up’ in updo, and even make those brows bushier. Fine-haired folks who tend to get oilier faster won’t live without powder. Blow-outs? Its most popular use is to maintain straightened strands as long as possible between washing. Blondes crave what brunettes tend to shun: a whitener to blend dark roots and create creamy tones throughout. Hairdresser Was Sharpton recommends Powder for curl that tends to droop a few days after washing. It doesn’t involve a blow-dry, yet restores some spring without disturbing the curl pattern. Powder has a mattifying effect, but if that’s not your favorite finish, use it sparingly and thoroughly work or brush it through (or even blast it with the blow dryer) to preserve more of your natural sheen. Hairdresser Dustin Heath reports achieving major volume that looks freshly washed by using an excess of Powder (“a ton of it”) and blow-drying it in with a flat brush (a round brush would create too much tension and not enough slip). Sometimes, squeaky-clean hair is too glassy to hold an updo. Use powder to add non-slip texture to help it stay up without hairspray. Tip: try dusting it directly onto pins and clips beforehand to help them stay in place. Backcombing can backfire when it’s time to brush it out. Try powder instead to get the same kind of lift (and hold the hairspray) to spare your hair some damage. Powder allows you to create downright dramatic period-appropriate effects. Simply apply it to unclean hair – or coat it with Wax or Hair Balm first to help it adhere – and layer it on until you get the look you’re after. Top it off with hairspray to seal. Apply powder on the underside of bangs with a narrow brush to keep them from separating, sticking to your forehead, or getting greasy. Strong brows are a powerful look, so make them look plusher or more groomed with a pinch of powder rubbed in with your fingertips. Get a lesson from Hairdresser Laurie Mason from Suite 8 in New York City above. As with all hair products, powder is easier to add than remove, so use a little, wait a few minutes to judge the effect, and add more if you feel you need it. 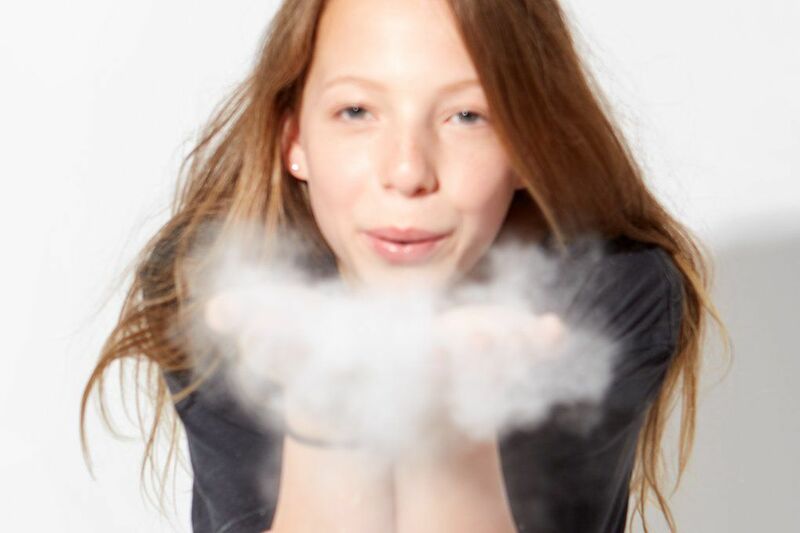 The key word here is “dry” – powder cannot do its job with any water in your hair (that would be called plaster). Hold the bottle several inches from your head. Section hair with the other hand and let powder waft into hair near the roots. You can also hold your head upside down while you do this. Let it sit for a couple of minutes before massaging it in with your fingertips as you would with wet shampoo in the shower. Flip your head upright again and smooth hair out a bit by gently guiding a brush through from roots to tips. Finish it off by lightly running your fingers through one last time. And then? Hands off! The less you touch it, the better it looks. Powder On! But remember: Dry shampoo is not actually a cleanser – it simply absorbs excess oil. We don’t recommend wearing it 24/7 – you wouldn’t leave foundation or powder on your face for days on end – as fine powder can clog pores and prevent the scalp from breathing. But when you need to get hair clean, consider a kinder, gentler way than shampoo. May we recommend New Wash?